Scherlokk 3.5 – Find and compare files. Scherlokk is a lightning fast file search utility built for precise and reliable search of every file that meets the search criteria. Music, pictures, bookmarks, documents, etc. can be found quickly and easily. Search can be done on any kind of built-in volume, portable volume (memory cards, USB drives), network drive (AFP, SMB, FTP), Thunderbolt or Firewire device (CD/DVD, external HDD, slave computer), etc. It does not matter if the searched file is hidden or system. 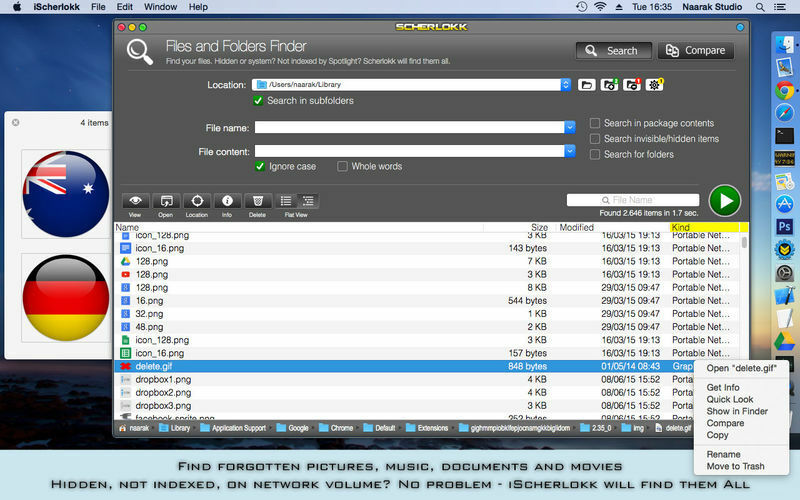 The file does not even need to be indexed by OS X to be found by Scherlokk. Specify the kind of searched file(s) (music, movie, picture, etc.) or some of the file attributes (size, date, etc.). For documents or data files, content can be specified. When searching with size range, Scherlokk calculates and displays all folders which fit in the range. Scherlokk searches through ‘real’ files instead of the Spotlight’s index. The index is not always up to date and does not contain all files. Extremely fast search engine finds your files quicker than competition. Scherlokk shows search results in a flat or hierarchical view which helps to find out which file is the one you need and how files are located in the folders structure. Clean and easy to use interface. Which files can Scherlokk find? Because Scherlokk is not based upon the Spotlight’s index, and has its own, powerful search engine, it will find every single file on any accessible volume in your computer. Scherlokk can compare any files (text or binary) and displays their differences, taking into account insertions or deletions. It uses a sophisticated algorithm for finding similar blocks in both files and shows them as a list of differences. Try it out and you will love it! Next story AnyTrans 6.3.6.20180412 – Complete iOS content management. Previous story WeatherSnoop 4.0.153 – Capture weather info from a Davis Vantage Pro weather station. Gemini 1.5.12 – Locate and eliminate duplicate files. HoudahSpot 4.2.6 – Advanced file-search tool. Gemini 2.1.2 – Locate and eliminate duplicate and similar files.